Gombin House in Tel Aviv and the Annual Remembrance Assembly (“Azkara”). 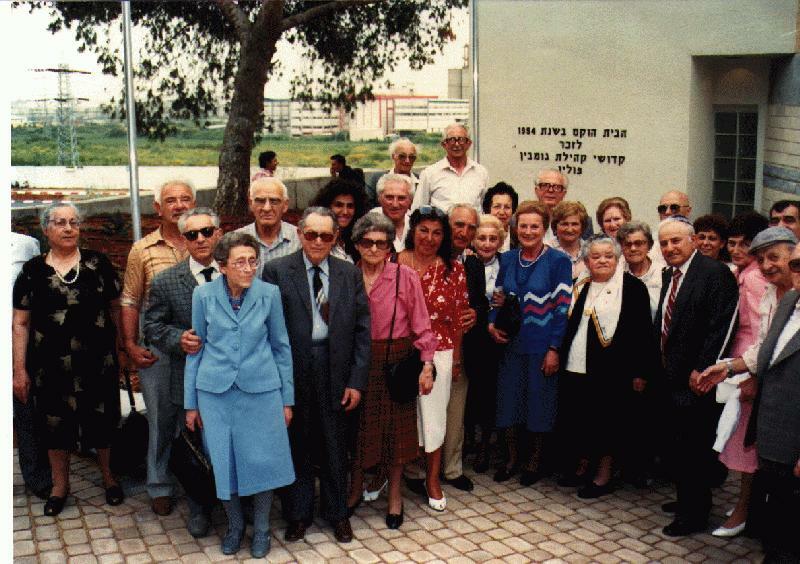 The dedication ceremony of Kossar-Karetzky Senior Citizens Center of the restored Gombin House on 11 April 1990, with the former Mayor of Tel Aviv: Mr. Shlomo Lahat. Rivka Aloni is in the first row, third from left and all the others are Gombiners from Israel. The house, founded in 1954, by Gombiner organizations from America, (but also Israelis donated money at the time, so I was told), served mainly for keeping memorial plaques and having a Hall for Remembrance Memorials (annual “Azkara”). The House was actually crumbling down, physically, and collected incredible amount of municipality taxes debts. For 10 years there were negotiations with various public institutions, mainly “Naamat”, but with no results. It is the time to note that the house was on "Dmei Mafteach", ("Key money") on Ottoman public land, without any legal possibility to sell it and cover the accumulating debts. Finally a contact with Tel Aviv Municipality was made, and the Mayor of Tel Aviv at the time, Shlomo Lahat, took upon himself to find a donator and restore the House. The main efforts and negotiations were made by Rivka Aloni, from the Israeli Gombiner Vaad, for many years, whose efforts and success to bring the House to what is now is meritorious beyond any words! He finally managed to find the American donators who contributed over $300,000 for its restoration, aiming for the public welfare, (Elders Community Center) and keep the commemoration of the Gombiner Holocaust victims there. The American donors whom the municipality found, agreed to give the money to restore the House, so it serves to any public cause, decided by the Municipality. They were American known contributors: Mrs. Carol & Mr. Bernard Kossar, but they are not the owners of the House! Except for a plaque in the entrance, they have no legal rights of the house. The Tel Aviv Municipality is the public owner of the place now. The municipality is running the place which serves as Elders Community Center and is a very nice, highly maintained and very active for the welfare of the elders of the city of Tel Aviv. The Gombiners Landsmanschaft is entitled to make there Remembrance assemblies, in coordination with the local management of the House. If we wish to add memorial plaques, make other assemblies, put a pictorial exhibition, it needs also approval of the Municipality, which is the official owner of the House. One should treat this as great achievement, to have a House with this possibility, and actually making those Remembrance Assemblies, which some communities don’t do anymore. In the famous book “Konin a Quest”, by Theo Richmond, we read detailed reports about the difficulties of the Konin organization and how, mainly due death, old age, and sickness, the remembrance assemblies faded away. It should show us how great the Israeli Gombiner organization achievement has been! The Table where the Khazan sits at the annual Remembrance Assembly in the Gombin House (photograph taken last Azkara 3.6.97 by Ada). TODA RABA ! 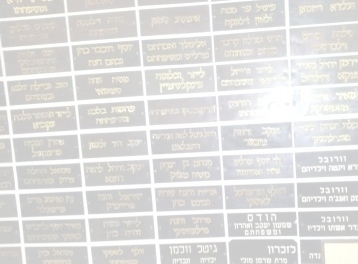 THANKS TO THE ISRAEL GOMBIN LANDMANSCHAFT ("VAAD"), LAST MEMEBERS IN THE PAST YEARS: IIZHAK ZIPRIS, SHOSHANA COHEN AND RIVKA ALONI, WHO KEPT THE ISRAELI GOMBINERS TOGETHER, KEPT "AZKARA", REMEMBRANCE ASSEMBLIES IN BEIT GOMBIN FOR 44 YEARS TO KEEP THE MEMORY OF THE JEWS OF GOMBIN WHO PERISHED IN THE HOLOCAUST. Last updated on July 17th. 2012 - The page was created in April 1998.